Use the arrows above the picture for navigation and click the picture itself to see the 'Update' and 'Original' versions. Information: This photo of Jupiter was taken by Voyager 1 on March 1, 1979 from a distance of 2.7 million miles (4.3 million kilometers). The region shown is just to the southeast of the Great Red Spot. A small section of the spot can be seen at upper left. 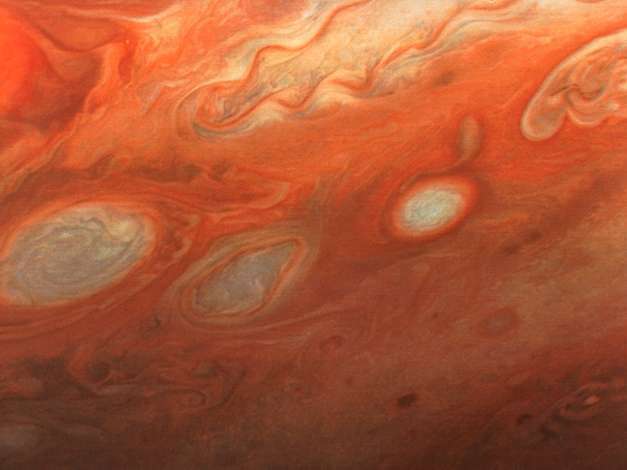 One of the 40-year old white ovals in Jupiter's atmosphere can also be seen at middle left, as well as a wealth of other atmospheric features, including the flow lines in and around the ovals. The smallest details that can be seen in this photo are about 45 miles (80 kilometers) across.